#942 Pain leaves good memories. I don’t do exercise at all in my daily life. I’ve noticed that I’m gaining weight recently. One day I had a chance to exercise. 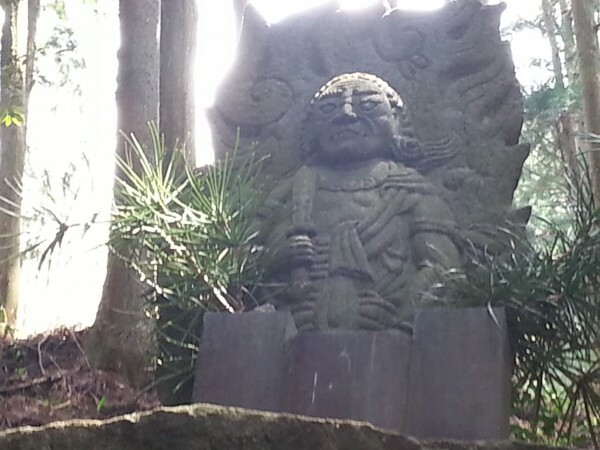 My friend invited me to go to a temple named “Otowayama Kannonji” in Nara prefecture. The temple is at the top of a mountain. After getting off a bus, we hiked up on a trail. This mountain is not so high, but it is sort of a steep trail. Each of us held a stick in our hands during the hike. My legs were getting tired and I couldn’t breathe very well. I usually don’t sweat but during the hike I sweated a little bit. I took a break while I was taking a picture. On the other hand, my friend was still full of energy. Finally we got to the temple. It took us one hour to get here. We prayed in front of the thousand-armed kannon which is renowned for its ability of fulfill the wishes of worshippers, especially those related to eye diseases. There was nobody else except us at the temple. When we walked down, my leg muscles were so tense that I had never experienced before. I couldn’t control my legs well. Since I didn’t want to miss the bus which runs only once an hour, I wanted to walk down fast. But I couldn’t walk fast at all. Then we missed the bus. We had to wait almost one hour at the bus stop. 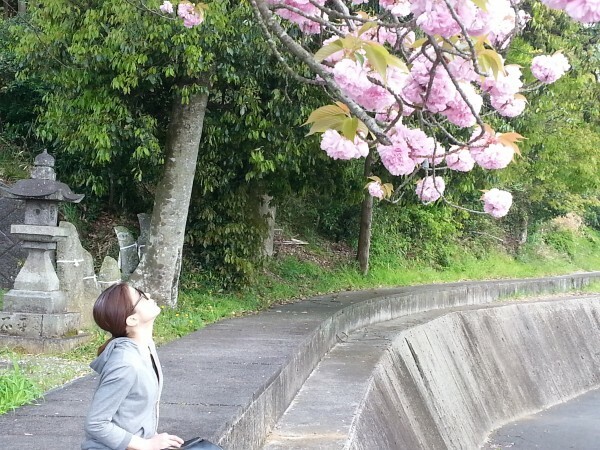 We were very tired, so we lay down and napped under a double cherry blossom tree. Next day my legs were not like mine, you know. My friend also had severe muscle pain. She will move to Tokyo from Osaka soon. It is very sad for me. Fortunately this time we had this unforgettable, albeit quite painful, trip together that will leave a good memory in our heats. 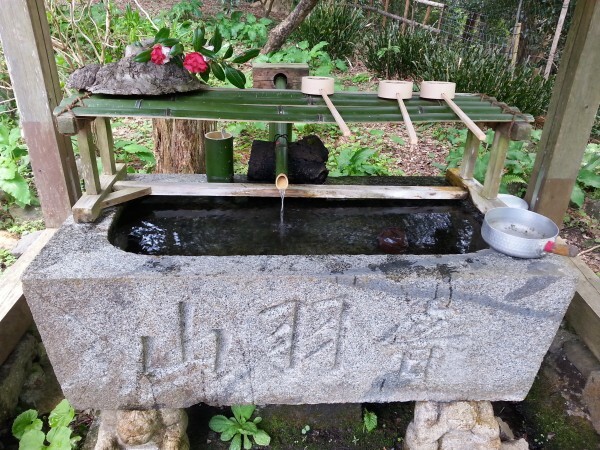 A place for ritual cleansing of hands and mouth with water. 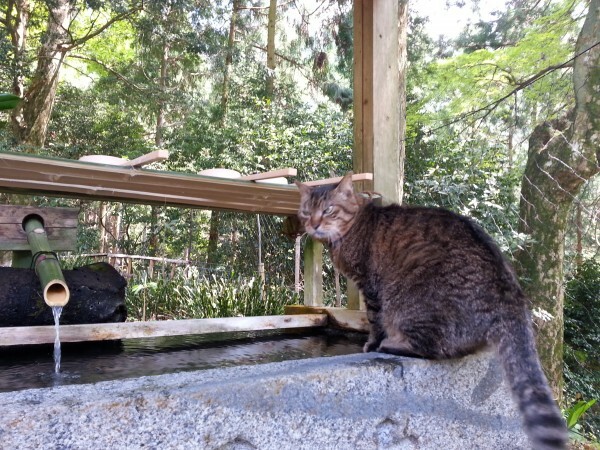 There was spring water in front of Fudoumyouou. It was very tasty. I took some water in a water bottle. My blog is one year old this month. A year ago I started blogging. At first, I didn’t know how to write a blog and I was afraid to tell my story and express my opinion, because I had never posted in a blog before. Even on Facebook, I barely posted any pictures. Although I only blog once a weak I think I’ve finally got used to blog recently. 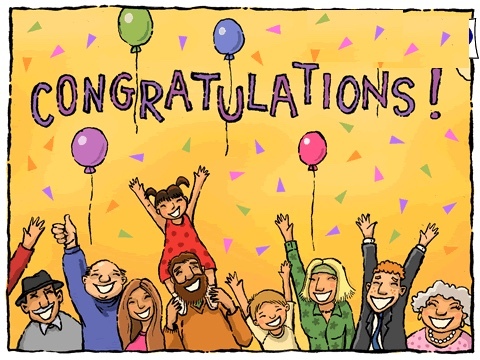 I’d like to say “Thank you!” to my readers even for spending their valuable time reading my blog in their busy lives. Well, let’s take a look at some of the posts from last April. For example, I wrote about “I played Mah-jong with Horiemon(#997)” and “My mother’s homemade kusamochi(#996)”. Horiemon is that celebrity that everybody knows. Kusamochi is my favorite sweet in Spring. Both posts were very short. The Mah-jong post was in Japanese and the Kusamochi post was only five sentences. My writing skill is improving a little bit, isn’t it? I hope so. However, the things that I enjoy doing don’t change at all. Which means I still play Mah-jong often and just ate a kusamochi 3 days ago. #944 Would you like to check your “equol” level too? Every woman may be concerned about menopause transition. We women simply can’t do anything about it. Recently I learned about a product on the internet. It is called “EQUELLE” from Otsuka Pharmaceutical Co., Ltd. This product claims that it can help women stay healthy and beautiful. “EQUELLE” is a supplement made from soybeans and contains “equol”. 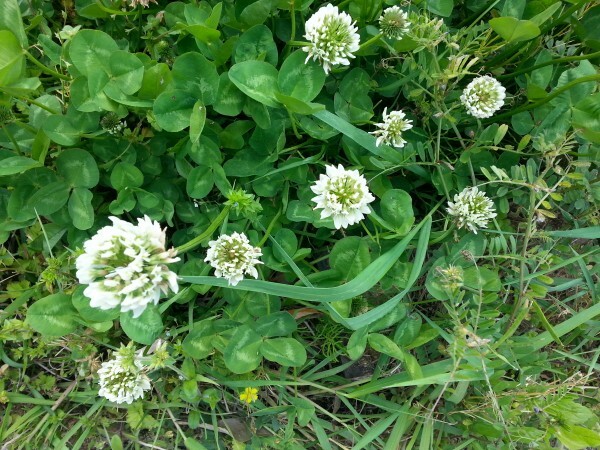 “Equol” is the key to women’s health and beauty during menopause transition. What is a “Soy check kit”? 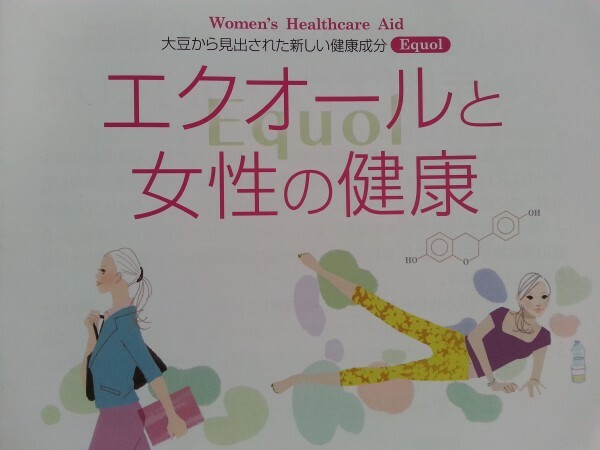 According to the pamphlet from “Women’s Healthcare Awareness & Menopause Network Society(NPO)”, only half of Japanese women can make “equol” by themselves. Whether if you can make “equol” or not, you can check by using a “soy check kit”. As I was very interested in it, I tried the kit and sending my sample to the company. The result was … ta-dah! Level. 4!! 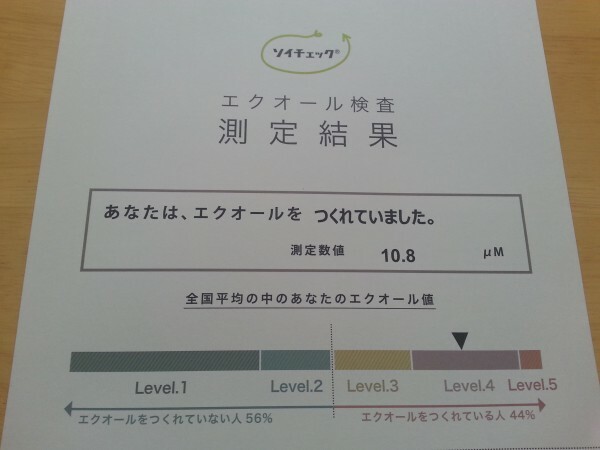 Level.4 is a good result and it means I can make “equol” by myself. If you can’t make “equol” by yourself, you can take “equol” supplement products such as “EQUELLE”. If you can make “equol” by yourself, you just need to eat soybean food like tofu and natto every day. For those who may not be able to eat soybean food every day, it is better to take “equal” supplement. Even though I am not experiencing menopause yet, it is still a good idea to take “equol” to help me stay healthy. Therefore, I’m taking “EQUELLE” for a month. If I feel any changes, I will report it to you. What do you think? Would you like to check your equol level too? 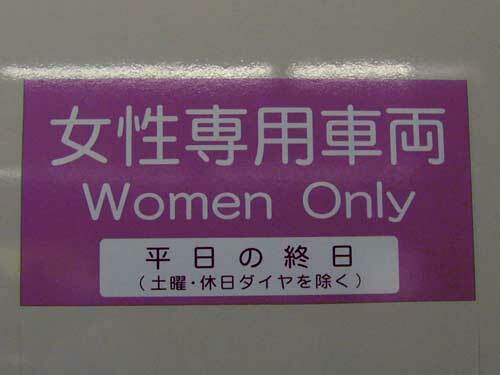 When I rode on the Midosuji line, I was in this women-only carriage. A businessman got in the carriage at Namba station. Although the carriage was full of women it looked like he didn’t notice it at all. Then he sat on a vacant seat which a woman left at Shinsaibashi station and started to use his cellphone. He still didn’t know that he was the only man in this women-only carriage. 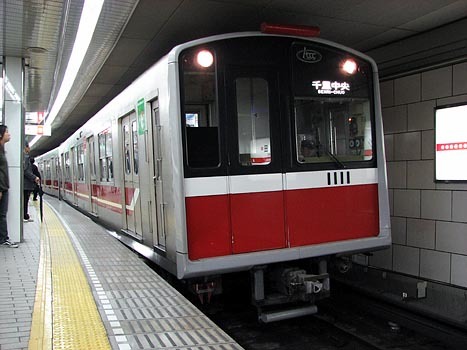 At Yodoyabashi station, another businessman tried to get in, but he noticed that it was a women-only carriage before he got on. He stopped right away and the door was closed. Unfortunately this businessman missed the train. I was just watching the interesting contrast between the two different businessmen. At Umeda station, most of the women including myself got off the train. The clueless businessman was still sitting. I wanted to know his prospective fate. At that time, a station staff at Umeda station found him and got in the train and asked him to move to another carriage quickly. At last the businessman finally noticed and looked a little surprised that he was in the women-only carriage. He immediately got off the train with a puzzled face. The train began to move and I also began to walk away with a satisfied grin.